As a company that prides ourselves on continuously improving our product and listening to customer feedback, we're excited to announce our newest feature release- scheduled reporting! Read more below. -Save reports with specific metrics that you'd like to see and schedule your reports to be delivered to your inbox. -Reports will be emailed to you at the specified time with a link to the report in ContractWorks. -A PDF or Excel version of the report will be attached to the report email, based on the preference you selected when scheduling the report. How Can Scheduled Reports Help You? - Helps you stay in compliance and in front of contracts without using an outside calendar system to remind you of milestone reporting dates. - Is an automated system that helps improve efficiency, giving you more time to focus on other important issues. - Used in conjunction with the ContractWorks notifications feature, scheduled reports helps you take proactive action on contracts and be vigilant on key changes or developments within the company's contracts. 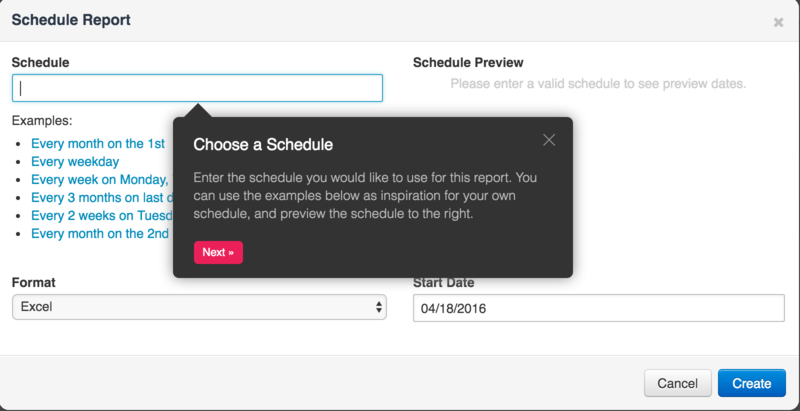 We'd love to know if you have had the chance to try scheduled reports and what you think of it. Additionally, if you have any questions on our new features (or any questions for that matter), we're also available to answer those. And if you're not a ContractWorks customer and you would like to learn more about ContractWorks for you business, you can request a demo here.